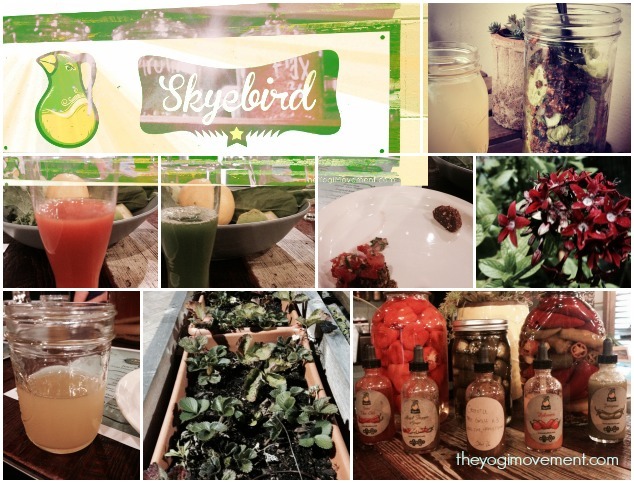 Get Healthy With Skyebird Juice Bar & Experimental Kitchen! One of my favorite places in Orlando (maybe in the world) is the East End Market. If you’ve been following my blog, you probably know that since I featured them in one of my first posts. One of my favorite things about the East End Market is Skyebird Juice Bar & Experimental Kitchen. I got so excited and all wide-eyed when I realized that Orlando finally had a place where I could get fresh and organic cold pressed juices! The first drink I ever had from Skyebird was the Thai Hot (Spinach, Celery, Cilantro, Orange, Apple, Lime, Lemongrass, and Jalepeno). Relax, it’s not THAT hot. It definitely has a kick, but the heat is nicely balanced with the cooling qualities of the cilantro, spinach, and celery. It’s my favorite and I can’t get enough of it! Give it a try, and let me know what you think! About a month ago, I did a 6 day juice fast. 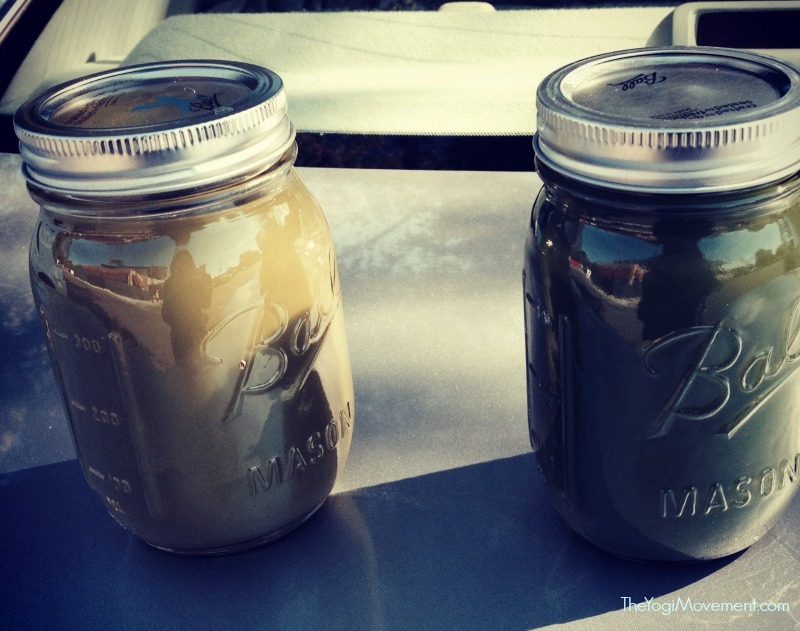 This was my second juice cleanse and I was much more disciplined and prepared than than my first time around. There were a few times that I wasn’t able to prepare juices in the morning, so Skyebird became a regular visit during my six days of fasting. It also really helped to break up my work day. It was great to get away from the computer screen so I could spend some quiet time drinking fresh juices in their garden (I could seriously hang out there for hours). 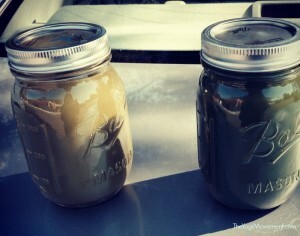 To the left is a picture that I instagrammed on a day where I got my two juices to go! You can imagine, when I found out Skyebird was doing a juice tasting I was ALL OVER IT! Yes, Please sign me up! I arrived at the East End Market after hours, and got to meet up with some fabulous blogger friends. Krystal, the owner started by greeting us and just telling us a little bit about herself and how Skyebird got started. She discussed how she wanted her daughter to grow up in a healthy and natural environment, so she attended the Institute For Integrative Nutrition, and resonated mostly with the raw lifestyle. Her, and her husband, Devin, opened a juice bar and named it after their daughter, Skye. It’s history from there! Leodavid, The Kombucha Extraordinaire, also joined Krystal and discussed the health benefits of their juices. His specialty is kombucha brewing, which I’ll get to in a bit! We started off with the Bright Eyes (Carrot, Apple, and Ginger), which was so amazing and refreshing! As they continued to serve us samples of the juices, we talked about the benefits of each juice, and why cold pressed juicing is so beneficial. Krystal also discussed how they recycle everything from their packaging to the pulp. Absolutely nothing is wasted! 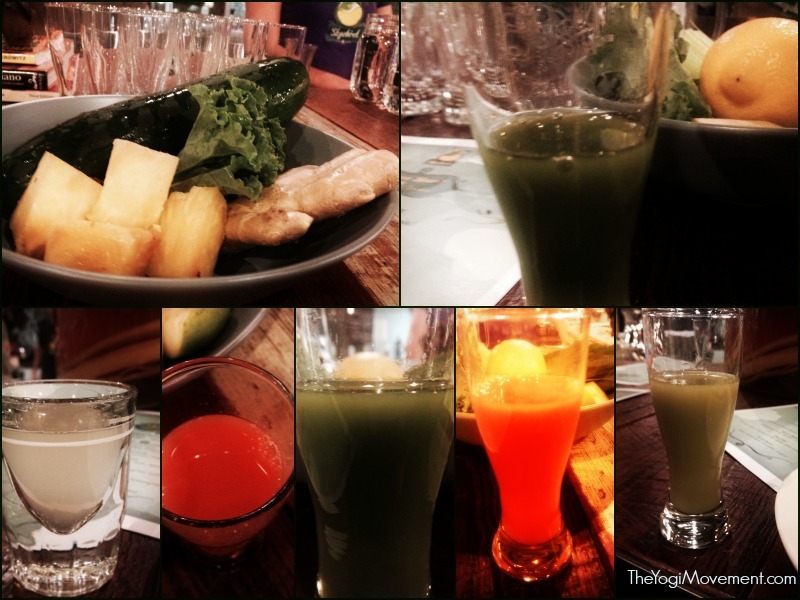 Below is a collage I made of the juices we sampled. They also set out bowls of their fresh fruits and vegetables as an example of what goes into each juice. I don’t have a picture of the Fresh Beets Juice (beets, carrot, apple, cucumber, and ginger) because it was so incredible that I devoured it before I had the chance to snap a photo (sorry)! On the bottom left is the spicy lemonade. You can’t go wrong with sweet and spicy; it’s the perfect combo! 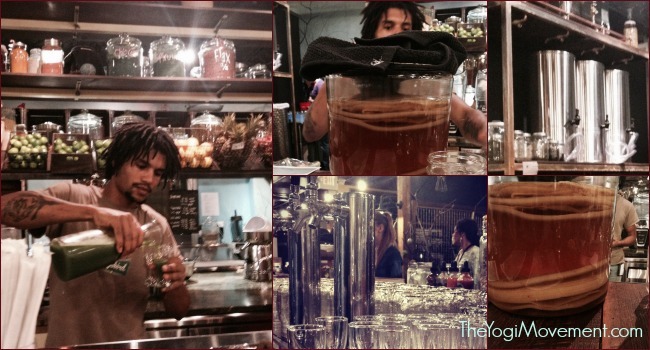 Leodavid talked to us about the art of kombucha brewing. You can see the big vats where the tea is brewed and served on tap in the picture collage below. The weird white stringy looking thing in the picture below is called a SCOBY, which stands for Symbiotic Colony of Bacteria and Yeast. Kombucha brewing is a fermentation process, which includes: water, black tea, the scoby, sugar, and whatever herbs and fruits or vegetables you choose to add to it. As it ages, they brew the tea with seasonal fruits and veggies just like they use for the juices. Leodavid explained that kombucha is important because it’s filled with B vitamins and probiotics which helps to break down everything in the body and digestive system. What I thought was fascinating was that as it ages over time it becomes more and more vinegary, and then you can then make salad dressing out of kombucha. I didn’t know it had so many uses, and I hope to learn more one day so that I can make fun dressings and sauces from kombucha. He also mentioned that kombucha is only as good as you make it. You can brew kombucha all day, but it’s the health benefits from the fresh fruits, vegetables, and herbs that do the work. 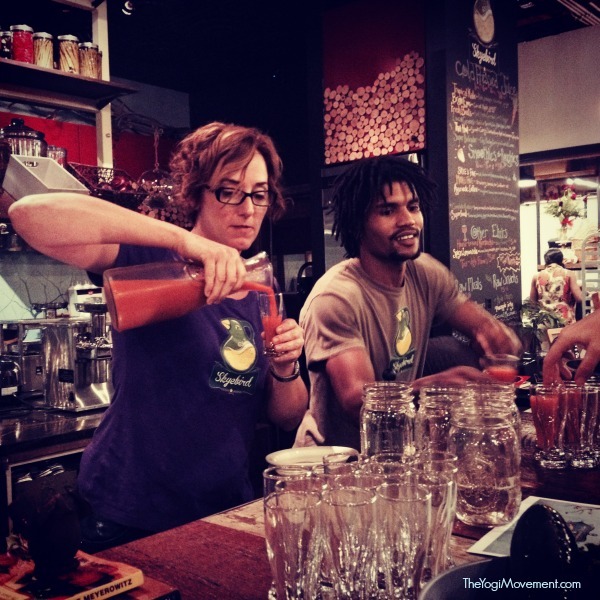 We sampled a starfruit lemongrass kombucha, which was seriously awesome. I love how creative they get! In the past, when I’ve purchased kombucha from Whole Foods, I felt like I had to force myself to drink it for the health benefits. I’m so glad that I can count on Skyebird to get some seriously delicious kombucha. The next kombucha we tried was a lot more fizzy, and when I asked Leodavid why this was, he mentioned that the longer it’s been aging, the stronger it becomes. Simple enough. After that, we sampled some of their food. I love how they recycle everything. The left over pulp is used to make raw falafel, taco salad (on the right), kale chips, pineapple jerky, and all of the food you see below. I know the pineapple jerky (in the middle) might look funny to you, but it’s a new favorite, and going to be on the way to my next foodie penpal. I dare you to try it. On the plate to the left is the falafel and a chocolate macaroon, which was to die for! They even make their own almond milk, and from the almond pulp, they make almond flour. Good stuff. It was definitely an amazing experience, and I hope you get to stop by and experience it too! It’s hard to choose, so just do what I do; go down the menu and order something new each time. Oh, and if it couldn’t get any better – they make their own smoothies and experimental sauces too! Last time I was there I had the Ayurvedic Coffee smoothie. So good! I asked Krystal why she does this and she said because of flavor and freshness. She said, “I don’t’ care how much you scrub vegetables, there is still dirt.” I love this concept because if you’re juicing, or on a detox, it would defeat the purpose to eat dirt! The main focus at Skyebird is nutrition. Since there is a health coach on staff and two herbalists, they want to make your juice cleanse enjoyable and perfect for you. 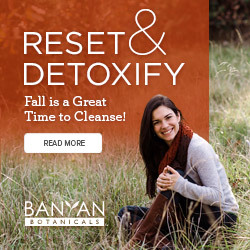 Rather than just packaging together the same juices and cleanses for everyone, they’ll meet with you, ask you some questions to understand your body type and dietary needs, and create the cleanse specifically for you. I can’t wait to do this myself. It will be great to have a health coach customize my cleanse and help me through it rather than just kind of guessing. They only prepare what is fresh that day and in season. Some things change daily, and that’s why they call themselves an experimental kitchen. For example, they might have to change up the type of apple they use which changes the flavor or the drink. Or, they might have to replace apple with pineapple. They might have to replace dandelion with kale. It just all depends what the day brings, and you can be certain that lots of love and care goes into preparing every juice. I mentioned above they recycle everything from their pulp to their packaging. Krystal mentioned they make their pulp available to the public for composting and supporting the downtown backyard chicken project. She said they have so much pulp, so if you need some for composting, give them a call! Not only that, they stay away from all plastics and serve everything in mason jars, which are also the to-go cups. If you bring them back, you get 10% off your next drink. What I love about it too is that while I have them at home, I can use them for storage instead of plastic, and then bring them back to Skyebird on my next visit. What a fabulous business model! Remember back in college when you would do Irish Car Bombs (or maybe you still do them), which is Guinness with shot of irish whisky? Well they do what’s called a Bucha Bomb, which is kombucha with a shot of their herb of choice, (ginger, tumeric, garlic). I think that sounds pretty fun and hope to catch them when they’re making their next Bucha Bomb so I can join in. Skyebird always has great events, and next week they have Joe Cross from the documentary, Fat, Sick & Nearly Dead presenting! They also have events about juicing, fermenting, brewing kombucha and tons of other awesomeness that you can find out at the East End Market Event Calendar here. I hope you enjoyed reading about Skyebird Juice Bar & Experimental Kitchen and love it as much as I do! Have you tried it? Tell me in the comments below. Better yet, upload your favorite drink or food in the comments!